Hi! 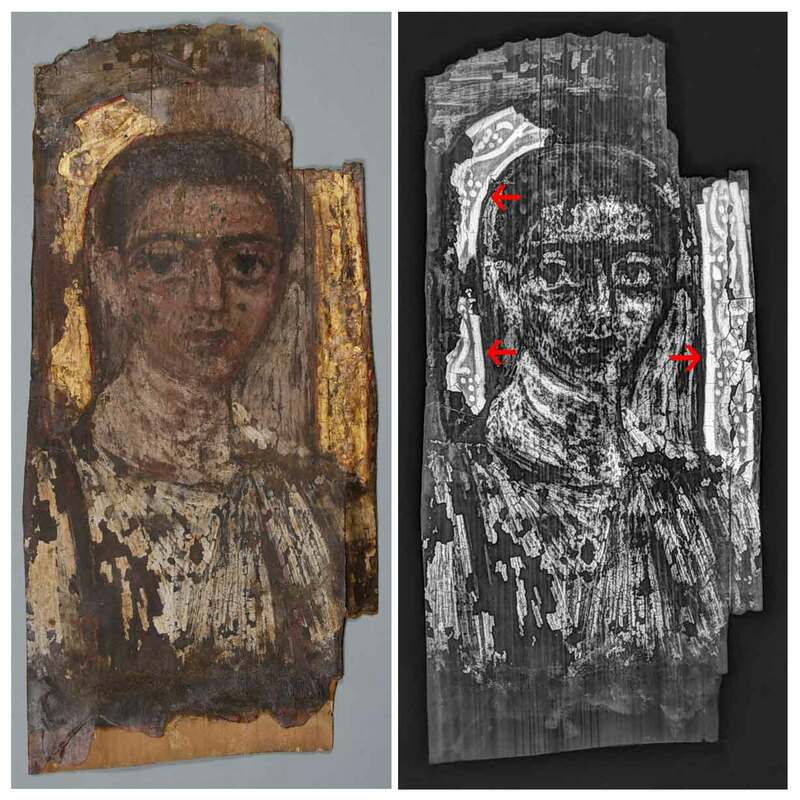 This is Eve Mayberger with more information about the Ancient Panel Painting: Examination, Analysis, and Research (APPEAR) project. 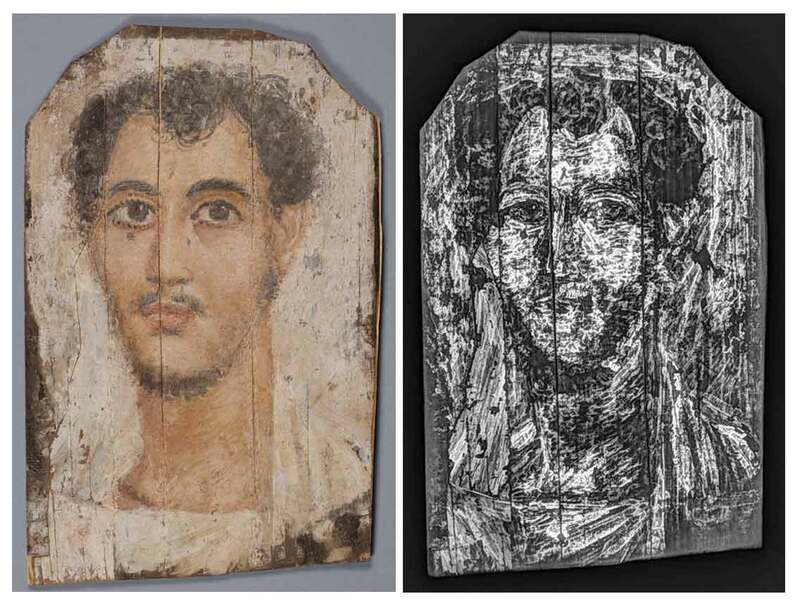 During the past few months, I have been investigating the three Fayum mummy portraits in the Penn Museum with digital photography, multispectral imaging (MSI), portable x-ray fluorescence (pXRF), and most recently x-ray radiography. X-ray radiography is an incredibly useful technique to understand different materials, manufacturing techniques, later alterations, and condition issues. The x-ray radiograph of the Portrait of a Young Man (E16213) illustrates tool marks characteristic of the encaustic technique. The pigmented wax is worked warm and one can see the individual brush strokes. The background is made with a wide brush while the face is heavily worked with small tools to create the delicate shading in the flesh tones. X-ray radiography can help record decorative elements that are difficult to see and documented under normal conditions. The gold frame around the Portrait of a Boy (E16212) is ornamented with raised decorations. The sheen of the gold and the later surface alterations make it difficult to see the overall design; however, the decoration is easily discernible on the x-ray radiograph. It is also interesting to note that the wood grain is visible. Sometimes x-ray radiography can show alterations to the surface or substrate. The Portrait of a Woman (E16214) shows that the artist decided to change the outline of the face. The annotated image highlights how the contours of the of the woman’s face was changed to give her a fuller cheek. Observe that the dark resin circle around the face is not visible in the x-ray radiograph. It is important to remember that not all materials (especially if they are of different densities) can be shown in a single radiographic image. 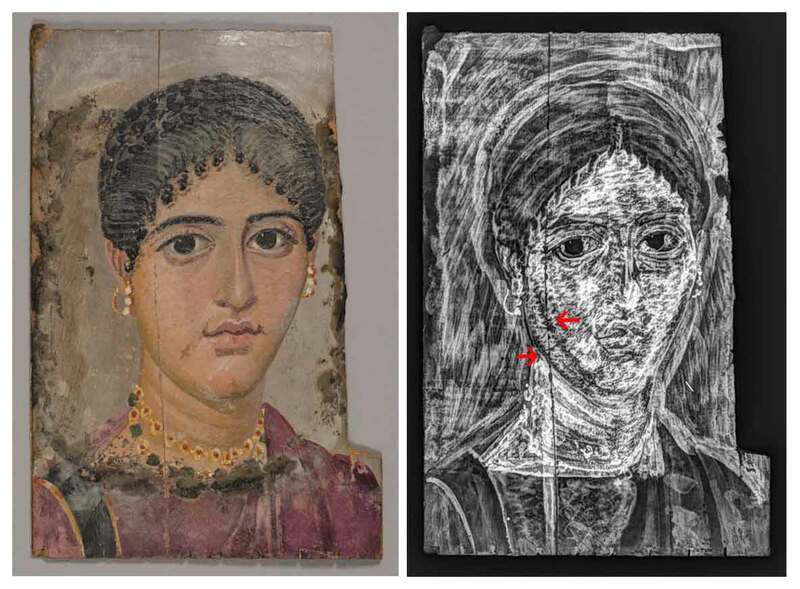 This entry was posted in analysis, examination, imaging, Objects In the Artifact Lab and tagged APPEAR Project, Encaustic painting, Examination, Fayum mummy portraits, x-ray radiography by mollygleeson. Bookmark the permalink. 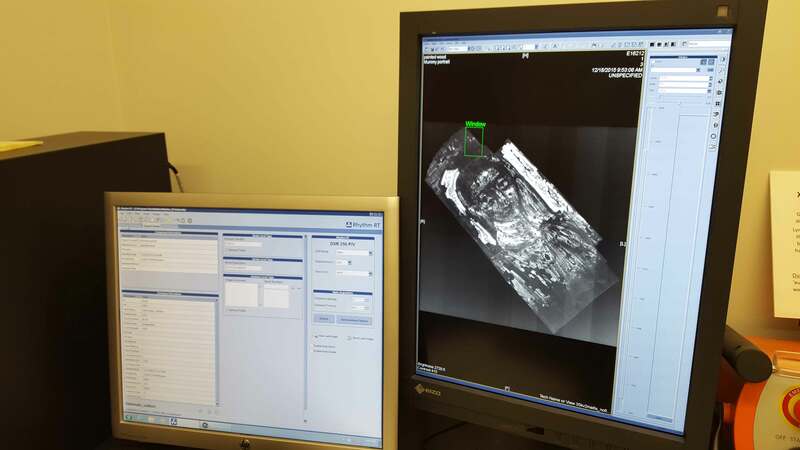 It’s wonderful to use X-RAY to explore the invisible things inside the collections and observe it in details. I think it is a really helpful skill for discovery. But will the X-Ray, to some extent, do harm to the collections ? I don’t think there is any danger to most objects, and the exposure is usually very brief.